King Narilmor is the ancient Ayleid king of Garlas Malatar who serves as the fourth boss of the Depths of Malatar. Purified with the blessings of immortality and loss of free will by Meridia herself, he stops at nothing to reacquire the right half of the Wrathstone from you, sabotaging your expedition and luring you into various traps along the way. When he is fought in the Tabernacle of Light Unyielding, he will split himself into four various clones: flame (red), frost (blue), lightning (purple), and light (white/yellow), all having attacks based on their element. The spirit of Quintus Verres also escapes during the battle, complicating matters as you have the option of helping Tharayya capture him again. 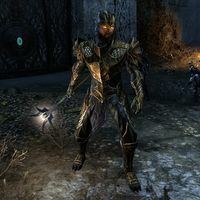 After Narilmor's defeat, his pact with Meridia transforms him into the Symphony of Blades, a vessel of her power fought in the final part of the dungeon. Tharayya: "A shrine? Why would the Imperials build this?" Quintus Verres: "Who cares? What matters is they found the Wrathstone. It's right there for the taking." Tharayya: "Imperials aren't known for their traps, but … looks clear." King Narilmor: "Submit to her will. It is the only way." Tharayya: "Over here! I'm alive!" King Narilmor: "Struggle as you might, you cannot deny the will of Meridia. Her power is infinite." King Narilmor: "Your corruption runs deep, but her purity is limitless. You will be cleansed." Tharayya: "Feel that? A chill breeze. We must be nearing an exit!" Tharayya: "Ah! The Pneumeria Chamber!" Tharayya: "Damn it! Quintus, get back here!" King Narilmor: "You defy our Lady of Light and desecrate her domain with the undead! I will bleach your souls free of all you ever were!" King Narilmor: "For three thousand years I have protected the Wrathstone! I will not fail her now!" "There is no light beyond hers." "Lady of Light, keep us from darkness." "I will not fail her …." "Purity is made from many colors." "I am every aspect of the light." "Through her, I am infinite." "My light viewed through a prism, is no less bright." "Flame is the vengeful weapon of light." "Undeath and corruption will be purged from my realm." "I suffer no dissent in my kingdom." He uses Meridian Style staves and armor, and wears the Ayleid Royal Crown collectible hat. This page was last modified on 26 February 2019, at 01:27.